Cell phone radiation in their pocket – no worries for BlackBerry users? 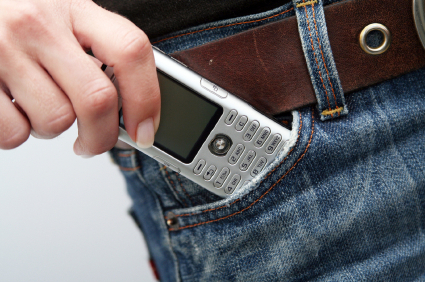 BlackBerry users are told to carry their cell phones in their pockets! RIM’s radiation testing engineers know that encouraging consumers to carry their cell phone in their pocket is in direct violation of federal compliance guidelines. 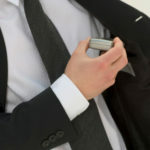 The FCC requires RIM to warn all users to never carry or use a phone closer than 1″ to the body when connected to a network or they will be exposed to radio frequency emissions that exceed the federal limit. RIM currently includes this FCC required radiation warning in all user guides, although they continue to hide it in fine print technical jargon in a section of the user guide that no one will ever see. Warning consumers about the 1″ separation distance is a federal compliance requirement by the FCC…. to disregard this radiation testing compliance directive is a blatant violation of 47 CFR Part 15. So, RIM continues to tell us that it’s OK to carry your phone in your pocket, even if doing so exposes our bodies to radiation levels that exceed maximum federal safety limits. How about RIM’s Pocket Pouch? Nope, it’s in violation of federal compliance guidelines, too! Leave it to RIM’s marketing department to come up with another way to ignore federal regulatory radiation guidelines. If positioning the cell phone in a pocket against the body, the pouch does NOT provide the 1″ separation distance as required by FCC law, so it is therefore not a compliant use. To encourage their customers to use their products in a potentially unsafe manner is not an ethical marketing practice. The FCC requires all cell phone manufacturers to warn consumers to never carry their cell phone in their pocket or they will be exposed to radiation emission that exceeds federal safety guidelines. I discovered that the BlackBerry cell phone I purchased for my 16 year old daughter had an FCC-required consumer safety warning to never carry the phone closer than 1” from the body or radiation would exceed the FCC safety limit of 1.6 SAR (the measurement of heat absorbed during exposure to cell phone radiation). She had been carrying it for 8 months in her pocket (as do most children, teens and young adults) receiving thousands of texts and phone calls each month with the phone directly against her body. Because that particular phone had the highest radiation of any cell phone on the market, the amount of radiation emitted when closer than 1” from the body most certainly exceeded the 1.6 SAR safety limit. The required safety warning which would have warned her to never carry the phone in her pocket was not in the user guide so we might have seen it; it was located on the CD that came with the phone which we had no hope of seeing as it was located in the bottom of the box; once I heard about the CD and found the silly thing, the safety warning which was supposedly on the CD could not be read on my MAC! It required a PC to even be read. Also, the elusive .pdf file which contained the safety warning was not referenced anywhere in the product literature. FCC requires ALL cell phone manufacturers to warn users that the radiation level can be dangerous if carried in the pocket. Were you warned? After a bit of research, I discovered that ALL cell phone manufacturers are required to inform consumers of this warning although few consumers ever see it since the FCC allows this warning to be buried in fine print in an obscure place in the user guide within technical radio frequency emission jargon. If you check every word of the user manual that came with your cell phone, you might see it. Get out a magnifying glass, as it will be in incredibly small type font. And, it will be buried in some FCC “compliance” section about radio frequency emissions or “separation distance”. Go on, see if you can find it. The FCC does little, if any oversight of cell phone manufacturers, so this industry-wide deception continues without consequence. The CTIA (powerful cell phone industry lobbying agency) is aware of this industry-wide practice, and has done nothing to stop it. they write bizarre, misleading “suggestions”, like, “Always maintain a minimum separation distance of 1″ OR better yet… “Refer to body-worn configuration requirement”. You are now warned. Spread the word to children, teens and others who carry cell phones in their pockets! Don’t let your kids carry cell phones in their pockets. Be informed. Find the safety warning for your phone and call your service provider and complain that the FCC-required safety warning needs to be in a prominent location in language a consumer would understand. Better yet, write to the president of your cell phone service provider or file a formal complaint with the FCC. Demand that the cell phone industry stop hiding the consumer safety warning!! We have a right to know!! What are they REALLY hiding? WARNING: Never carry your cell phone in your pocket! If you receive texts or calls while the phone is on your body (in a pocket or tucked into the waistband of your pants, or wherever) you are exceeding radiation exposure guidelines established by the Federal Communications Commission (FCC). So, how many of you have seen this warning??? It appears in the ‘fine print’ of the user manual packaged with most cell phones. Is it in yours? It’s important to take the time to look. I decided to do a little research on my BlackBerry Pearl. And, what I found out is alarming. Translated this means: You’re NEVER supposed to hold the BlackBerry Pearl (and possibly other BlackBerry devices) closer than 1 inch from your body when it’s turned on! Like I’m supposed to MEASURE the distance between my phone and my body?! How about my 17-year-old daughter who gets 3,500 text messages a month with the phone in her pocket? Not held an inch away, but right next to her reproductive organs? The guys she hangs around with also carry their phones in their pockets….right next to their family jewels. What level of radiation are these kids exposed to in a month’s time?! What the *&%+ is going on?! Don’t carry this device in your pocket or you will be exposed to radiation that exceeds federal guidelines. This would make sense if the manufacturer actually wanted to warn the user. When I called the BlackBerry manufacturer and asked why there wasn’t a warning in the product literature that came with the phone, a RIM vice president told me to not worry because all RIM BlackBerry products meet FCC radiation emission guidelines. Verizon happens to provide users with a separate, bright red, 2-page pamphlet called “Consumer Information about Radio Frequency Emissions.” That’s very cool, except it fails to warn the user not to carry the phone around in the pocket or directly on the body. In fact, it seems to say “no problem.” How bizarre is that?! This quote that Verizon uses is from the FDA/FCC website. Oh, great! Our very own US federal agencies…you know, the ones that regulate cell phone radiation… are giving the manufacturers an excuse to avoid warning the consumer that “against the body” actually means using a holster – a holster that you have to buy even though it’s required when you wear the device on your body. To add insult to injury, the cell phone industry has figured out how to scam an additional $15 – $25 out of us when we buy a new phone. What a lucrative marketing strategy. Go find your user manual that came with your phone. See for yourself. Or, if you don’t have the user guide any more, or there wasn’t a safety section in the package about “body-worn operation” or “radio frequency (RF) safety,” call Verizon, AT&T, T-Mobile or whoever sold you the phone. Check it out. Get a holster if you carry your phone around on your body…and don’t put the thing in your pants, pocket or wherever…unless you want to expose yourself to more microwave radiation than FCC allows. That’s right. Microwave radiation – the radio frequency that comes out of a cell phone when we make a call, send a text message or download something off the internet is the same frequency as the radiation that cooks food in a microwave oven. We, the people have the right to know the truth about cell phone radiation…..but, the industry claims they have a Constitutional right to not tell us.